Halloween truly was a night of horror for Merle Vered, who came upon what appeared to be a group of teens, blowing up a bunny rabbit with a firecracker just behind Brighouse elementary school. "We had been out trick-or-treating and were just crossing behind Brighouse to get to the fireworks display." Vered noticed a group of what she thought to be teens and a lot of smoke. "I wondered if they were going to set the school alight." As she and another parent, along with eight kids, got closer, the teens bolted. "We noticed something on the ground and the kids ran ahead to look." They found a rabbit with its guts oozing out. "I don't want to be graphic, but there was a hole in its stomach," said Vered. There was also a bag nearby, which she thinks might have been used to carry the rabbit to the park. She quickly tried to get the kids away. Another adult (she assumes he was the school janitor) seemed to be taking charge of the situation. "It was very upsetting. Some of the girls started crying." In fact, she, too, burst into tears when she got home and her husband asked how it went. What had been a great night was blighted by what appears to have been an act of senseless cruelty. Vered said she doesn't like to be the bearer of bad news. "I'd rather read good news, but I felt I had to say something about this. I hope the schools can do something about talking to kids about treating animals with respect." I am deeply upset and outraged at what I came across on Halloween evening. My children and I and a group of their friends went trick or treating and then decided to go to the fireworks display at Minoru Park. So we took a short cut through the park adjoining Brighouse elementary school. We noticed a group of teenagers that appeared to be letting off fire crackers. I was concerned because they were very close to the school. They let off another fire cracker and they all ran away as we approached them. It was then that we noticed something on the ground -- to my utter horror and dismay it was a dead rabbit that had obviously become the victim of these teenagers. It had been literally blown up by the firecracker/s! I was shocked by this senseless act of cruelty. To whoever did this, if you perhaps read this or if you know who did this -- this is not a Halloween prank or a joke but obviously the act of a very sick, sadistic person/people. You need help and my only consolation is I believe in karma and this will come back to you/them. How could anyone hurt an innocent and defenseless bunny, even if it was already dead? You need to respect all living creatures, both in life and in death. I was very sad that my children and their friends had to witness and see such a tragic and barbaric event on an evening that was supposed to be a fun-filled night. I hope those individuals responsible will do some soul-searching and realize that this kind of behaviour is sick and that they need help. It saddens and worries me to know that these people are living here amongst us! Unnecessary abuse against all animals should not be tolerated. Animals were put on this earth to live just like us and they do not deserve to be killed for or tortured by people with no hearts. Animals deserve to live and be cared for. There should be harsher punishments for people who abuse their animals or pets. Animals cannot protect themselves against us, it is our duty to protect them. If anyone knows who did this senseless, heinous crime please do the right thing and come forward and report to the police. This cowardly act of unspeakable cruelty perpetrated upon a defenseless little rabbit is much more than a juvenile prank. Intentional and malicious anti-social behaviours by individuals such as these mindless thugs ought to be of grave concern to all of us. Numerous studies have shown that kids who derive enjoyment from committing atrocities toward animals are likely to be violent to humans as well. I cannot imagine the pain and suffering this rabbit endured and sincerely hope these teens are apprehended. We simply cannot close our eyes to this horrific crime. The sadistic killers who participated in this cruel and deadly attack on an innocent and defenseless rabbit need to be caught. Research has shown that there is a definite correlation between cruelty to animals and violent crimes against humans. I cannot erase from my mind the sheer terror and hell this rabbit must have felt before his or her life finally ended. The above two letters were published November 6/07 with the title "Cruel Halloween prank appalls readers." Re: "Dead rabbit horrifies mom," the News, Nov. 2. Regarding this cruel Halloween prank, let's not forget the animal that suffered. Understandably, people are horrified that such acts of unspeakable cruelty toward animals often translate itself into human cruelty or abuse. But why is it that in our society, many people cannot react to or understand another living being's suffering unless it is compared directly to its effect on a human being? For the rabbits in Richmond, the city and many of its citizens had no real concern for the feral rabbit population's welfare until it hit the farmers in the pocketbook. Why does our society dismiss the suffering of another living being until it affects them directly? How did we become so uncaring toward other living beings? Our solution is to get rid of the "problem" only once we become affected. I commend the woman who brought the story of the rabbit forward. Hopefully, it will not have died in vain. February 29, 2008 Bunnies shot, maimed, left for dead. This is the title of a news article appearing in the Richmond News. Two rabbits were shot and killed with a pellet gun over a three-day span late last week in Minoru Park. Another rabbit was injured so severely its leg required amputation. It's believed to be the work of a group of young males between the ages of 12 and 18, according to witnesses who frequent the park. There is a reward being offered to anyone providing information that leads to the arrest of these offenders. This is senseless and horrific cruelty against vulnerable and innocent little critters, and cannot go unpunished. Please report any acts of violence and cruelty to the authorities and be an advocate for animals - help stop the cruelty! REPORT SITUATIONS OF CONCERN TO ANIMAL ADVOCACY ORGANIZATIONS & AUTHORITIES. In 2013, the BC SPCA launched its animal abuse hotline. Call toll-free 1-855-622-7722 If it’s outside of office hours or an emergency call your local police department or the RCMP. BE PERSISTENT. March 7, 2008 Minoru Park is surrounded by a number of high-rises as well as a hospital and seniors housing care centre. Evidently some of the elderly residents have complained to management about the homeless rabbits wandering into their gardens and eating their shrubs and flowers. A permit to cull/kill the rabbits from the City of Richmond has been requested. Here again, we have heartless humans who think nothing about destroying little lives, for something as petty as flowers being munched on. March 9, 2008 We went to Minoru Park and saw a number of domestic, turned feral, rabbits. While some people were feeding the bunnies, they were very wary and quickly scampered off into the brush if one got too close. Several were chasing each other and two in particular, seemed to be rather territorial. May 29, 2008 We continue to monitor the situation in and around Minoru Park. A number of baby rabbits have been spotted on Richmond School Board grounds, and two adults were struck and killed by vehicles late last night. Correspondence with Richmond City Hall confirms that as part of a broader wildlife management plan, there is a program in place that involves "selectively moving or euthanizing rabbits on public land where the population has become destructive." We were assured that animal control activities are conducted in a "professional and ethical fashion that focuses on addressing public health, safety and other concerns in a humane manner. " However, we cannot keep eradicating other species and destroying the environment to accommodate only human life. 2009-2012 Rabbits are still around Minoru Park, and other areas in Richmond like the Auto Mall. Rabbit rescue and advocacy groups have taken in some of them, and provided sick and injured ones with medical care. Our group, RAPS, Bandaids for Bunnies, and local citizens are doing what they can for these poor animals. November 19, 2012 According to recent media reports the Richmond Auto Mall has reached an agreement with the Precious Life Animal Sanctuary in Washington to provide refuge and care for at least some of the feral rabbits, pending approval from the Ministry of FLNRO. The application was just recently sent in. It should be noted that Brent Gurd, a wildlife biologist for the Ministry, said the government hasn’t held direct talks about the rabbits with RAM, but notes domestic sanctuaries often run into problems when it comes to long-term funding. “We don’t want to just move these somewhere else, because they are an invasive species. You just create problems for other people.” He added that if funding disappears the government is responsible for the rabbits. In a conversation with the owner of Precious Life, he said it is inaccurate to say the sanctuary is able to take any of the rabbits. It’s just not possible due to factors such as lack of funds and unavailability of help. The refuge is off the beaten path and not easy to get to. December 14, 2012 Ralph Turner, founder and owner of Precious Life, has been convinced by Rabbitats-Rabbit Rescue to take some of the auto mall rabbits. Trapping has been quietly underway since the FLNR Ministry has not approved the permit needed for relocation. (an onerous process & matter of politics) It should be noted that animal welfare organizations, advocacy groups, and others routinely pick up stray or abandoned rabbits without a permit, and the government knows this. A small number of the mall bunnies have apparently now been sterilized and plans are underway to bring them to the US sanctuary. Sadly, there have recently been a high number of rabbits run over or killed by predation. Construction is also set to begin, leaving the rabbits more vulnerable and at risk. 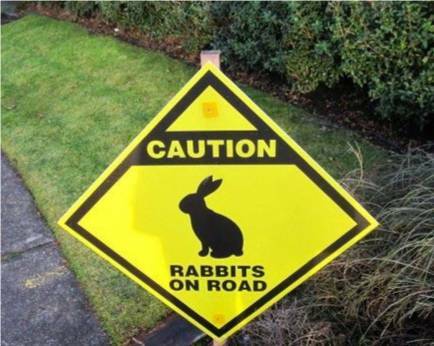 There are newly erected signs at RAM advising: Caution – Rabbits on Road. December 23, 2012 We have been told that none of the ‘feral’ rabbits have been sterilized. Rabbitats is having a tough time gathering donations. January 27, 2013 To date, RAM rabbits have not been brought to PLAS, although a few others have made their way south. While some small feeding stations have been placed around the mall, there is an inordinate delay in moving forward with this relocation project. That small window best for trapping is fast closing. We’ll be seeing a lot of newborns unless there’s some action soon. February 3, 2013 There was a light rain falling as we checked on the rabbits today. Sadly, we found a young one deceased beneath a tree, off the main road. Many of the dealerships have re-landscaped, leaving the grounds more open. Two of the feeding stations now have open-ended pens around them in preparation for capture, although Rabbitats has not yet received the government permit. February 6, 2013 Rabbitats has received the permit. It restricts them to holding 50 rabbits at a time. One would expect trapping to begin immediately although volunteers seem to be in short supply. We’ve been advised that there are several rabbits that may be in need of medical attention - hopefully Rabbitats is on top of it. March 28, 2013 After all the fuss about obtaining a permit to send the rabbits to Washington, Rabbitats has switched to focusing on finding placements locally. 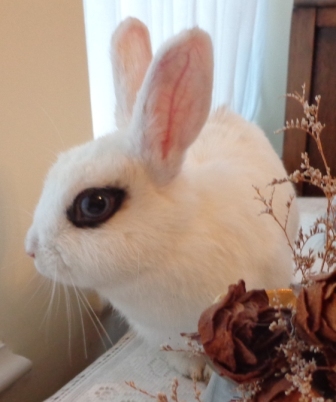 In a recent Craigslist ad, it was noted that RAM is looking for parties interested in "establishing great rabbit environments, in which case adoption fees will be waived." This has raised more than a few eyebrows in the rescue community. Adoption fees are in place for good reason and advertising right before Easter is poor judgment, at best. Rabbitats says it received a number of applications for adoption although they didn’t “really have any” available. (they are looking to relocate groups of rabbits using the rabbitat concept or to ‘sanctuaries’) Bunny Homes/Julia was “handling regular adoptions” with her own rabbits. Note: The Richmond Animal Protection Society (RAPS) currently has about 80 rabbits for adoption, many of which were found abandoned in public spaces like Minoru Park. April 30, 2013 Apparently, it’s moving day for the rabbits at the Richmond Auto Mall. Fewer than 50 were captured, much lower than anticipated. They are being transferred to unrevealed destinations. A lone grey bunny was spotted on the 28th but other than that, it appeared deserted. However, there are other colonies throughout Richmond, with some 4-week-old ones recently picked up from the BC Ferries Dry Dock and brought to RAPS. May 1, 2013 We should have known – the rabbits haven’t gone anywhere. The same thing happened with the UVic rabbit rescue when some 50 rabbits being held at the PNE in preparation for their journey to Precious Life Animal Sanctuary was delayed. Volunteers with Rabbit Advocacy continued to care for them while Sorelle Saidman (who applied for the gov’t permit) repeatedly promised it wouldn’t be much longer. May 2, 2013 Where will the RAM rabbits go? The Auto Mall rescue received a provincial permit on the understanding that the rabbits would be shipped to Washington. That permit expired March 1, leaving Rabbitats in violation of the Wildlife Act and staff at the Ministry of Forests, Lands and Natural Resource Operations are pressing the group to abide by the original terms of their application and export the animals. But Rabbitats is looking for people living on farmland to take larger numbers and house the rabbits in enclosed rabbit-scaled villages with gardens. They are also in need of a new space for Rabbitats headquarters as their building is due to be demolished. (Source: Randy Shore, Vancouver Sun - May 2, 2013) Why did Rabbitats let the permit expire? What happened to all the plans that were supposedly in place? Best of luck to the rabbits now being held hostage – they’ll need it. This project was inadequately planned, with multiple issues and risks being disregarded by Sorelle Saidman, who chose to plough ahead. Terms of the agreement were clearly violated and to top it all off, rabbits are still roaming about - not the desired outcome. We await next moves. Note: Rabbitats is not a non-profit, nor is it a registered charity. The term “rabbitat” is a concept, often used to define a type of living environment for rabbits. The FLNRO Ministry is adamant that feral domestic rabbits remain under Schedule C of the Wildlife Act. Rabbit Advocacy has been corresponding with all levels of government for years on various legislation and policy pertaining to rabbits. It’s a complicated issue, and cannot be neatly packaged into a one size fits all approach. For example, rabbits are ‘managed’ through legislation such as the Community Charter, the Prevention of Cruelty to Animals Act and the Livestock Act. There are no Codes of Practice for the Care and Handling of Rabbits, and no regulations or licencing of breeders. Bylaw infractions are largely complaint-driven and Animal Control officers do not spend time rounding up strays. Rabbit welfare is not a priority issue with government or in general society, for that matter. We all have the ability to change that. May 5, 2013 We spent the afternoon with Bandaids for Bunnies and RAPS, as well as checking for abandoned rabbits around the BC Ferries dry dock. None were spotted. Rabbitats, meanwhile, is still seeking local landowners interested in ‘adopting’ multiple rabbits. May 24, 2013 Rabbit Advocacy has been a strong voice for rabbits for two decades and continues to work with all levels of government to bring forth progressive legislation. Our experience, research and fact-gathering information has been appreciated by many. We firmly believe that thoughtful, proactive measures are far more advantageous than costly and ongoing reactive ones. Whatever the challenge, we see an opportunity for victory. Related: Pet Habitat, District of North Vancouver, new rabbit bylaws, come on Burnaby! 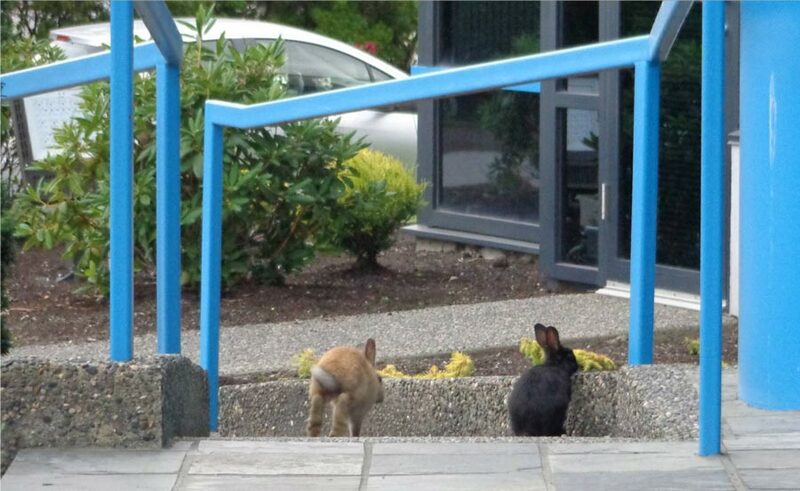 June 20, 2013 Sadly, reports of stray rabbits in several municipalities have had us again speaking with animal control staff and bylaw officials as to strategies to combat the dumping of unwanted pets. In one instance, it is likely that the rabbits came from a specific breeder. July 2, 2013 Just recently, Rabbit Advocacy was asked to help capture a Hotot seen around a Richmond construction site. We were successful! Concerned individuals and volunteers from other like-minded groups are working cooperatively to get these abandoned pets to safety. Rabbit Advocacy, Richmond Animal Protection Society, and several others with no affiliation came together. Thank you! Comment: Rabbit Advocacy has been contacting the BC government on rabbit issues, including the designation of the European rabbit (domestic) as wildlife under Class C regulations of the Wildlife Act for many years. We again contacted Steve Thomson, FLNRO, regarding its position on abandoned rabbits, updated our MLA, Jane Thornthwaite, and recently met with Mary Polak, Minister of the Environment. We are united with other rabbit rescue and advocacy groups and individuals in speaking out and taking action on behalf or rabbits. Modifying the regulations of the Wildlife Act is one small piece of a much larger issue. Citizens have always picked up abandoned rabbits and brought them to safety, regardless of government rules, and always will. One can say that it’s our moral duty to do so. August 13, 2013 From the Vancouver Sun: Rabbit Rescue snarled in red tape, a letter writer responded with: Don't waste money moving rabbits; eat them, Letters, Aug. 8. Carmina Gooch countered with: Feeding rabbits to poor a mindless proposal, published Tues. Aug. 13th. How many times do we have to hear such primitive and mindless proposals as to feed rabbits to the poor? This does nothing to address the root causes of poverty, nor does it even begin to address the ethical implications of a society that exploits its weakest and most vulnerable members for personal use. Can we not move beyond the mindset that we are more deserving of life than other species? Domestic rabbit abandonment is a problem instigated by humans. Suggesting that these animals be fed to the needy is heartless and impractical. We can feed both body and mind and advance our humanity without killing animals. Comment: Government agencies, rabbit advocates, and rescue groups have all been targetted with blame and fictitious accusations during this drawn-out project. Rabbitats was advised against proceeding in the manner it did and knew the government's position on relocating feral rabbits. The permit requested was given and lapsed. As the rabbits now sit in limbo, the September moving date is looming near. Blaming others is not only pointless and unproductive, it speaks more to the individual than anything else. Get on with the project! The rabbits deserve better. We all do. September 6, 2013 Our recent response from the Province regarding abandoned rabbits has sufficiently addressed our requests. We continue to communicate with our MLA and appropriate officials/agencies on rabbit-related matters. Words to live by: Be the change you want to see in the world and lead by example. RAPS recently adopted four rabbits to a single home while rabbit advocates have saved more from a sad existence in Minoru Park. Many are in rough shape and require medical attention. We are picking up a ‘free’ rabbit who has been bred over and over and no longer a money-maker. Meanwhile, there is redevelopment of a car dealership at the Richmond Auto Mall, and additional dealership expansion coming. Rabbit habitat has also been reduced as landscape modifications continue. A small group of rabbits is more vulnerable now that some shrubbery that provided cover has been removed. 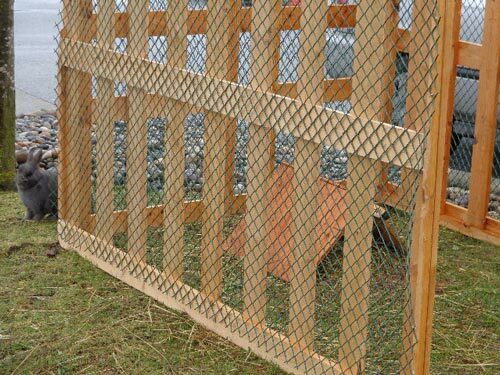 October 2013 The Auto Mall rabbits scheduled to move to Precious Life Animal Sanctuary has been delayed due to several matters, such as having to replace netting and Rabbitats’ attempts to have its original permit with FLNRO revised. 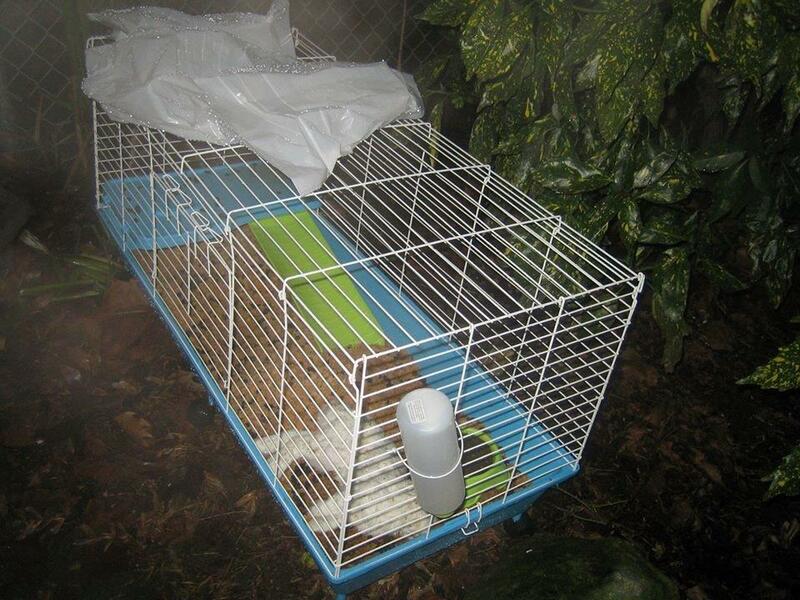 Update: It's the end of the year and the captured rabbits have not been relocated. Rabbits are still running loose and reproducing. Predictable, yet a letdown all round. In our ongoing communications with government it’s been reiterated that municipalities potentially have a large scope of regulatory authority, including that of authorizing new shelters for abandoned rabbits. Rabbit Advocacy has always worked with all levels of government in helping create new policies, bylaws, and legislation pertaining to rabbits and other animals. April 27, 2014 The rabbits previously captured at the Auto Mall are still in limbo, having just moved to a smaller garage onsite. They will not be going to PLAS as per the original permit agreement signed by Rabbitats with the BC government two years ago. Because free-roaming rabbits were left behind, they have been reproducing and concern is that the population will rebound. Additionally, people are dumping their unwanted rabbits at the dealerships, as well as alongside the road and at a nearby business centre. There has been considerable controversy surrounding the export or import of rabbits and other companion animals by animal welfare groups and others. In short, it’s people creating problems, and then trying to fix or manage the bungling. For the sake of the rabbit, the environment, and all of us, do not release your unwanted rabbit/s outdoors. 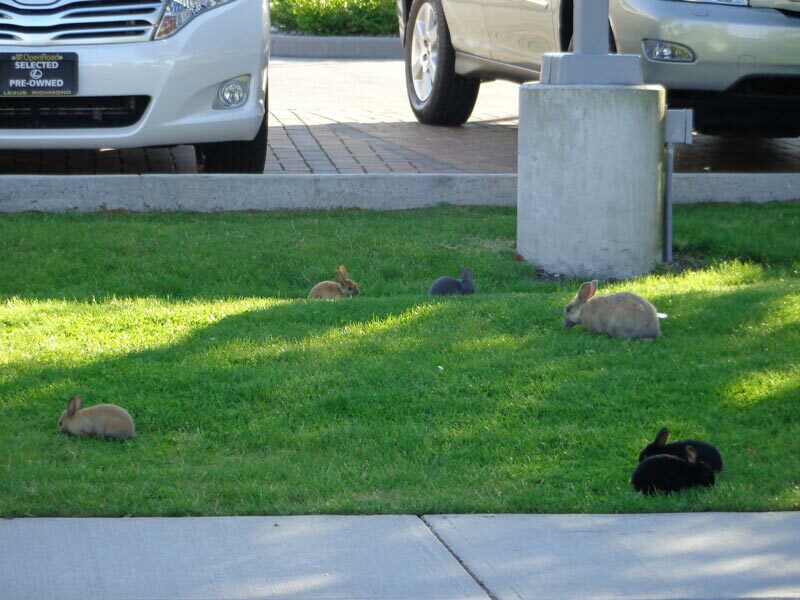 July 22, 2014: It was nearing sunset as we drove through the Richmond Auto Mall, and as we approached the dealerships and other businesses on the north side, we saw increasing numbers of rabbits, from babies to adults. All in their usual locations. The Mall’s contract with Rabbitats had ended with rabbits left behind, and this is the result. We have since been told that there are no immediate plans for removing the rabbits, and that so far the numbers aren’t too significant. We counted 24. December 27, 2016 In the early evening hours, a Richmond woman who does daily patrols of Minoru Park, discovered a dead white baby rabbit dumped in the bushes inside a new cage. All indications are that the rabbit was alive when heartlessly discarded by his owners. Estimates are he was only three or four months old. City staff came later to remove the body and cage. Rabbit Advocacy contacted the media and City of Richmond Parks. The BC SPCA had already been notified. This despicable act is illegal, cruel, and immoral. There’ll be no justice for this little rabbit. RIP little one. Your life mattered to us. We continue to fight because we continue to be outraged by such crimes against those who cannot unite and fight for themselves. As a civilized society, our opposition to all forms of animal cruelty must be resolute. Richmond full of discarded rabbits and their offspring; are there any answers?